It can be hard for small companies to hire STEM interns and future employees when competing against the HR machines of industry tech giants. Where large organizations rely on their well-known names, small Minnesota businesses rely on SciTechsperience, a free, state-funded internship program that connects small companies to a pool of top STEM talent for paid internship opportunities. On top of helping employers find and hire the extra help they need, SciTech also reimburses each company up to $2,500 per student hired, to help cover their wages. 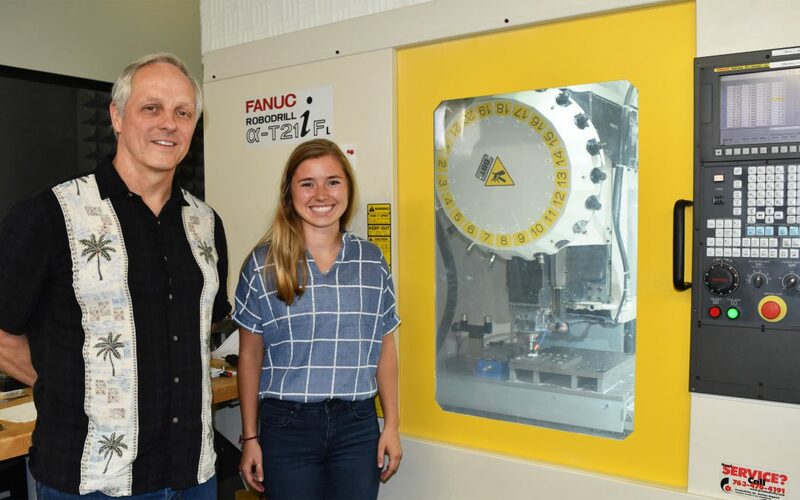 Not long after Funk and Celadon Systems enrolled in the program, they found Haley Larson, a material science major at the University of St. Thomas. They scheduled an interview, made an offer and hired Larson for the summer as their newest mechanical engineering intern. Celadon Systems, based in Burnsville Minnesota, designs and manufactures ultra-high-performance probe cards (an interface between an electronic test system and a semiconductor wafer) for the semiconductor industry. Larson’s job primarily involved engineering “plates” to help hold interfaces in place but she also worked on a variety of other tasks, helping out wherever she was needed. This was Larson’s second internship working in her field. Her first was as a design engineering intern at a much larger company. Transitioning to Celadon gave Larson a unique chance to compare the company culture and overall experience of both work environments. The main difference between working at a small business versus a large company, Larson said, “is being able to see the whole process.” At Celadon, she wasn’t limited to a single department. Larson could consult with the sales team, or talk with Celadon’s head engineers if she needed to. Interning at Celadon also meant she could regularly chat with Funk, the vice president of R&D, and it was through those conversations that she received valuable feedback about what courses she could take the following year that would be the most beneficial to her career.